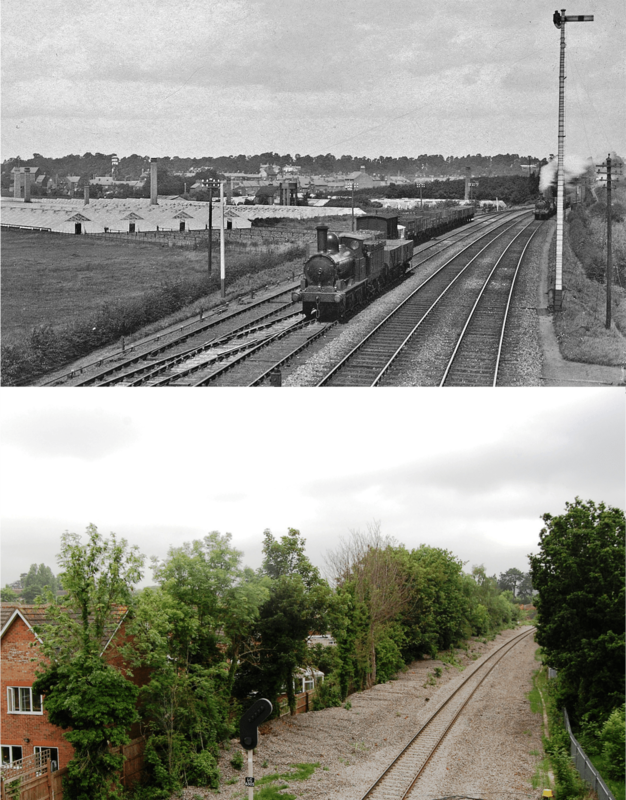 This week’s Then & Now comparison comes courtesy of local historian Robin Leach, who has written extensively on the town’s history, including books focusing specifically on the railway such as Rails to Kenilworth and Milverton (Rookfield Publications, 1999). This remarkable photograph is part of the London & North Western Railway Society archive (which is based in Kenilworth) and is used with permission; grateful thanks are extended to Mike Musson and the Society. It is taken from the station steps footbridge between Farmer Ward Road and Priory Road looking north; the date is unknown but appears to be after 1907 as it seems the water tower (left distance) has its well-known Singer Cycles advertisement painted upon it. The Albion Chapel can be seen extreme left. The extensive rows of the greenhouses of Whateley’s nursery are prominent; the nursery was at least 20 years old at this time. His obituary states that it was Richard Whateley who instigated here the growing of strawberries in Kenilworth for market purposes, and with his son Henry he later added tomatoes and cucumbers. At least six chimneys for heating the houses can be seen, as well as a water tank alongside the long-gone onsite house. The nursery’s location so close to the station enabled easy distribution of produce all over the country. The loco in the centre appears to be shunting wagons from or to the train parked on the sidings, perhaps for the Whitemoor brickworks siding out of shot to the bottom-right. Another freight train is approaching, the signal for it is set at stop, perhaps due to the shunting manoeuvres taking place. This train has just passed under the Spring Lane road bridge; note the road’s embankment is covered with trees or bushes. The now view is particularly uninspiring. It is impossible to get the same angle as the original footbridge was between the two existing ones and not so high. The nursery lasted for close on a century until it was covered with Offa Drive and Cherry Way in the late 1950s.